Type H., fig. 79 (R 494; Montelius: Svenska fornsaker 507). The handle consists of wide guards with an elliptic cross section. The upper guard is especially wide; the greatest width that any of the upper guards from the Viking Age attained (3.6 cm.). The guards have most often slightly curved, or in the older specimens, clearly ridged upper sides. They are seldom entirely flat. The pommel has three sides, so it has a wide base. It can also be somewhat tall; its height ranging from 2.5 - 4.5 cm., while the most common is 3 cm. Oftentimes however, the pommel has fallen off and is missing in the find, but the type is never the less evident in the wide upper guard and the striped ornamentation that we shall discuss shortly. It has, however, occurred that it has been confused with R 489 during the cataloging of swords of this type; [R 489] is an entirely different type in that, among other things, the guards have quite a different cross-section. Especially the older swords of the type make a heavy and massive impression and are to a certain degree related to [~90] other types that appear in the earliest Viking Age (B - E). Finally it should be noted that the pommel in the most usual type is always connected to the upper guard by rivets. Both the guards and the pommel are covered with thin silver or bronze (or copper) plates, and once every so often with brass which has the appearance of gold. In many instances there are different types of metal on the same sword, in the sense that, for example, silver and copper are interwoven into simple geometrical figures. The metal is connected to the iron [base] by forming close-set horizontal furrows and thereafter hammering the other [covering] metal into these. This has resulted in the present grooved or knurled surface appearance. This is, as previously stated, not its original appearance, but has been caused by wear. Originally, the surface was apparently quite smooth. The patterns on this type are extremely simple, and where there are different metals or interchanging vertical bands, they create a checkered pattern or a more intricate stair shaped pattern. Fig. 80. Eide, Gloppen, N. B. 1/2. Fig. 81. Krokstad, Melhus, S. T. 1/2. In a couple of cases there is smooth bronze sheeting on the over and under side of the upper guard. In one single case there are remnants after silver sheeting with figure-ornamentation. In four cases there are, between the upper guard and the pommel, a raised band of bronze, often pearled (fig. 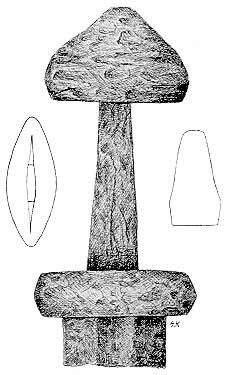 80), hereof also sword guard and pommel C 8598 from Holbø, Vaage of the E-type (fig. 64). In two cases the guard and the pommel are entirely of bronze (fig. 80). Likewise, the upper hilt is of bronze on sword T 1441 from Krokstad, Melhus, S.T. (fig.81), [~92] and its guard moreover has quite the same shape as the two others: tall, wide and ridged. We shall soon discuss it in more detail. In one case from Trøndelagen, the upper guard is of type C and the lower guard of type H. It is, however, true that the handle shaft [tang] is broken, but the two parts fit perfectly together at the fracture point. Something similar seems to have been the case with a Swedish sword (Statens hist. mus. Inv.-nr.6011, Uppland), where there is also a lower guard of the H-type, but where the upper guard has been of the B-type, since the pommel is absent. In one specimen there are »véttrim« [ferrules] of bronze, with a compact rim of animal heads pointing upwards and downwards respectively (fig. 82). In this way it is just like an individual specimen of the D-type or almost like the sword of the C-type from Orkney Island (look under this type). Otherwise I know such »véttrim« only in two other finds, namely C 16107 from Fredrikshald and C 1194 from Dybe by Mandal. In Hovedkatalogen O.Rygh considers both to belong to the Middle Ages. 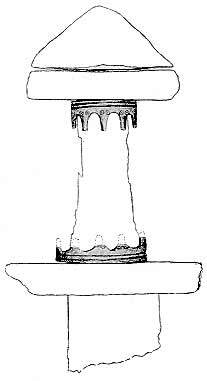 The first he even considers to be a sword pommel in the shape of a compressed crown. Fig. 82. Vig, Rennesø, Stav. 1/2. Within this type there are a couple of subtypes of handles that we shall discuss here. They are evidently related to the H-type but they are too few to be discussed as separate types. First we shall take note of a small group of three specimens , that have not had the usual striped ornamentation on the hilts. Two of these specimens, from Dynna, Gran and S.Farmen, Hedrum, show an upper guard and pommel fused together. It is that same development that has created a whole separate type: the C-type out of the B-type, but that in this case was not tried or duplicated in more than these two cases. 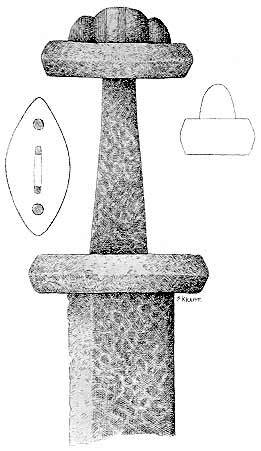 A third sword from Kluke in Biri seems not to have had a pommel in that we cannot find holes after any rivets on the lower guard and moreover, the handle shaft [tang] is merely flattened on top. One sword C 21704 (fig. 84) has [~93] lost its pommel, and it has been replaced by the same kind as that on the sword in fig. 72. All these swords have handles of the most massive kind with ridged guards. 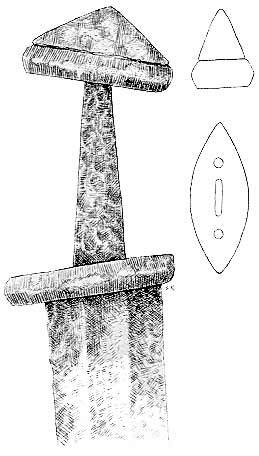 Moreover, there is a single sword, the previously mentioned T 1441 from Krokstad, Melhus [fig. 81], where, of the guards, only the upper guard has been preserved. This guard is of bronze and is lacking a pommel. Instead there is fastened, in the rivet-holes on the upper hilt, a simple iron hoop made of one single rod flattened on both ends. The same is the case with a Swedish sword from Dalarne (Uppsala, Inv. -nr. 1043). However, the guards are narrower and more slender here, which in many respects makes it similar to sword C 4979 from Homerstad, Stange, Hedemarken (fig. 135). It will be discussed in a separate entry. Of this type they have found 213 specimens. The blades are mainly double-edged. Of 194 identifiable specimen 142 are double-edged and 52 single-edged, accordingly 73.1% are double-edged and 26.9% are single-edged. As we see, this type is well distributed across the whole country. However, the inland counties of Kristian, Buskerud and Bratsberg do not have a large portion of them, and neither do Akershus and Hedemarken. The coastal areas are richer however, except for the poorer counties of Nedenes, Lister and Mandal. The type culminates so to speak in Trøndelagen, whereof one fourth of the finds are from. Many of the swords have damascened blades; several also have  inscriptions or imitations thereof. Lorange depicts two such swords with "Ulfberht" [inscriptions] on the blade. If one looks at the weapon-combinations under this type, there are numerous other weapons that occur in the same finds. If one should look at all the finds simultaneously, it would seem quite hopeless to order them into specific time periods. We must remember however, that the type is very numerous and contains over one tenth of the material from the [entire] Viking Age. There is no doubt therefore that this type has existed longer than any other type. We must therefore initially look at the time period when it first appeared, see if there is reliable evidence that it really appeared together with older forms of weaponry, investigate further which types of weapons occurred at the same time as this type, and also see if it is certain that these occurred together with later weapons. If we can prove that the type occurred both together with early and with late weapons it would also be interesting to investigate whether there is any change to observe in the form or shape of the handles of those swords occurring with the earlier [weapons] and those occurring with the later weapons. The same is also the case in finds where oval buckles or rattles occur. We shall first consider the spearheads. Here we see that they are concentrated mainly in an older group of about 20 finds in which there are spearheads first and foremost of type E; but also of type A and B. Type E occurs in 11 finds together with swords of this type [type H]. Thereafter, type F occurs in 10 finds and type C in a couple of finds. Finally, we have in four undisputed finds, type I and in one find a blend of type D and E.
Of the axe blades it is predominantly type D that is of consideration here, or maybe just as much a transitional type between D and E, but [~95] also the older type B and type A, even though not usually in its oldest form. Likewise, type C occurs in two finds from Trøndelagen. Additionally type F occurs and a couple of undisputed later forms of type K.
Of the shield bosses there are predominantly R 564, but in a couple of finds R 562 also occur. Of the rattles there are also predominantly the earlier forms, but in one find we have later ones as well. Finally, in a double burial, it seems also here to be mostly single buckles (6 finds), but in an entire 4 finds we find double oval buckles as well. Hence it follows that a predominant portion of the weapons and other objects found together with swords of this type belong to the early or earliest Viking Age. This is indicated by the spearheads of type A, B and E, as well as axe blades of types A - D, the shield bosses R 564 and older, partly the eldest, rattles and the single bronze buckles. In my opinion the grave in B4756 from Vik in Stryn must belong to the same early time period. Schetelig however, dates the find in its entirety to the end of the 9th century. Schetelig is probably basing his opinion on the oval buckles (according to the catalogue of type R 647), of which I cannot judge. Both the axe blades which are a definite D-type, even without a ledge on the blade, and the spearheads which are of an old E-type, must belong to the first half of the 9th century. As we also have seen previously, axe blades of the E-type and spearheads of the C-type can possibly date back to the middle of the 9th century, but are rather more likely to fill the second half of the 9th century. Especially the axe blades of the E-type were used in the beginning of the 10th century, and even later in time than that. Fig. 85. Kyte, Voss, S. B. a: omtr. 1/2, b-c: 1/4. But we also have later types. First we have an axe blade of the K-type, that does not appear together with weapons of earlier types, but often rather with weapons of later types such as swords of the X and Y - type. Likewise [~97] we have an axe blade of the L-type that appears together with pronounced later weapons. The same is the case with spearheads of the I-type, that also appear together with later swords, rattles and low shield bosses. Those swords of the H-type that in this way appear together with later types are not so numerous, but they are undisputed, and of such great importance as proof that a sword type can really extend over [a period of] 100 years, that these finds ought to be mentioned. First we have C 15917 from Garder, Hovin s.Ullensaker, Akh. where in the same find we also find spearheads of the remarkable mixed type between D and H and moreover, axe blades of the L-type. Both the over and underside of the lower guard is here furnished with silver plates with figures. The width of the guards show never the less that it is in fact this type we have here. Thereafter, C 18175 ff., Hyrven, Skjaak, Krist., where the axe blade is of the K-type and the spearhead of the same type as in the previous find and it has a low shield boss. Likewise, B 6149 from Nedre Kyte, Vangen s.Voss, S.B., where there is a spearhead of the I-type (fig. 85). This find confirms also in a different way that a sword of the H-type can very well extend into a later time period. The middle furrow [fuller] on the sword is here namely distinguishably narrow as on some of the latest swords of the Viking Age. There seems to be good reason to believe that at least the blade on this sword is from the second half of the 10th century. Furthermore we have B 6609 from Totland, Os, S.B., where there is an axe blade of the K-type, and finally T 6919 from Hynne, Skogn, N.T., where axe blades and spearheads are of similar types and where there are swords of the M-type, besides. These six finds show undoubtedly that the sword type H can extend even down into the 10th century. In Vendelgraf IX we also have an undisputed find dated to the 10th century in which both Sassanian coins and an ornate fitting for a horseback pad show that the find is from the 10th century, most likely from the middle [of the century]. Thereof it becomes evident that the type was known and used in this country in the 10th century. We have no less than ten finds with spearheads of type F and about as many axe blades of the E-type. These finds, that are not as numerous as the earliest finds, but however more [numerous] than the latest finds are a definite link connecting the early and late finds. Next, we shall investigate how far back in time the oldest finds extend. In two finds we have, as previously mentioned, axe blades of the C-type. These have their origin  in the Roman Iron Age. In this country the type occurs in Trøndelagen, and here it also extends back into the early Viking Age. Both our finds are indeed from Trøndelagen (T 3361, Stjern, Aafjorden, S.T. ; T 6906, Hynne, Skogn, N.T.). In one of the finds there is also one of the wide-bladed spearheads that probably has been approximately like R 520. In the other find there are single-edged swords without guards and a spearhead of type A. The same spearhead type has been found together with the many times before mentioned sword of this type included in the Universitetes Oldsakssamling 1917 (C 22117, Østre Kamfjord, Sandeherred). The sword has the longest blade that so far has been observed in the swords of the Viking Age: 90.7cm. We have furthermore heard that together with this type have also been found axe blades of type B and spearheads of type B. There is therefore no doubt that it appeared just before the onset of the Viking Age, even if there are only a few finds. I will mention the recently arrived find C 22117 as a typical such find with a blade exactly like the latest single-edged swords without guards from the 7th period. As a typical find from the early Viking Age I will cite C 20168 from Torshov, Gjerdrum, where there are axe blades of a pronounced D-type, shield bosses of a pronounced R 564, just like the rattles which are of a very old type. This find I will date to the beginning of the 9th century. If we now look at the shape of the sword handles, we will see that in earlier finds the hilts are always ridged, more massive and they make a heavier impression. If the hilts are lacking ridges the type has already exited its earliest stage. In the later finds it transcends smoothly over into type I (Montelius: Sv. Forns. 505), which makes a pronounced younger impression. It is of interest to note that the three specimens without ornamentation all belong to the older group, likewise do the swords with bronze hilts and T 1441 from Krokstad, Melhus where there is a hoop instead of a pommel [fig. 81]. The same is also the case with B 6685 from Eide, Gloppen, which has pronounced massive guards (fig. 80). These are found in a grave where there evidently has been a double burial of a man and a woman in the same coffin. The woman had oval buckles similar to R 647. According to Montelius' chronology this dates to the first half of the 9th century. Another typical older find is C 4293 ff. from S.Kaupang, Tjølling, where we have axe blades of the D-type, a spearhead of a wide E-type, a shield boss like R 564 and an older rattle. We have good examples of the transitional group in B 2944 from Sundalen, ytre Holmedal, N.B. and B 4852 from Brekke, Lavik, N.B. 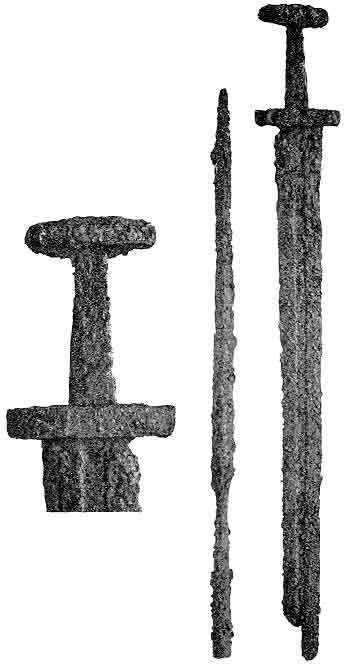 The result of the Norwegian material should therefore be that this type with massive ridged hilts appeared at the onset of the Viking Age or a little before [this time]. It seems to have blossomed during the first half of the 9th century, together with swords of type C and the other massive sword types. But it continued appearing, maybe particularly [~99] at Vestlandet, further into the century's second half, even if less numerous, and appeared at least until the middle of the 10th century. The later of these swords appear together with the I type, which has developed directly off of the H-type as a subtype. This type is by no means limited to our country alone. There are many swords of the H-type, especially in Sweden, apparently also here the most numerous of all the types. Both in Björköfundene and on Gotland there are several of them. Likewise it is known from Gestrikland, from Småland, and from Jämtland, where the sword is ridged and is found together with a spear point of the E-type. Following the 10th century date setting by Arne in Vendelgraf VIII of a spear point of the same type, Hallström also dates this jæmtlandske find to the same time period. As I previously have attempted to show the dating by Arne is not correct, and the sword's ridged guards makes it also reasonable to date the sword to the first half of the 9th century. However, this is not the case with the sword from Linga in Södermanland. This sword is without ridges on the guards and is found together with a spearhead of the transitional type between F and H and can be placed by the help of other reliable items to the beginning of the 10th century. With respect to this sword, I am in agreement here. Moreover, the Swedish material is in agreement with the Norwegian material in many respects. In Lunds museum I have come across a sword with a pearled band between the pommel and the upper guard, moreover also with a curiously simple »véttrim«. This sword was found together with axe blades of the C-type. The sword also has massive ridged guards. It has already been mentioned that we have a sword from Uppland with an iron hoop instead of a pommel as in T 1441 from Melhus. Likewise, there is similarity in the metal covering. We find the same plaid pattern and wide vertical bands with alternating metals. In the British Isles there have been found a few swords of this type. According to the notes by Gustavson and Schetelig there should be two specimens in Dublin's museum, likewise in Edinburgh's museum (according to Schetelig). A sword from Ronsay, Orkney with »véttrim« of bronze in the shape of a wreath of animal heads is in Edinburgh's museum and is just like the sword from Vik on Renesøy. From Islandbridge, Coffey and Armstrong depict one, or maybe we can say two, swords of this type. One of them seems to have vertical bands, the other however seems almost to belong to the I-type with ornamentation more common in later types. The two previously mentioned Ulfberth swords point to the fact that the type has also been used in the Franconian countries. These are not of the oldest massive types and the Ulfberth swords also do not belong to the earlier period of the Viking Age. It is a remarkable and noteworthy characteristic that the oldest swords of this type make the most domestic impression. One cannot easily avoid calling this a domestic type, even though a few of the blades must have been forged abroad.